Federal prison population drops Holder announces. 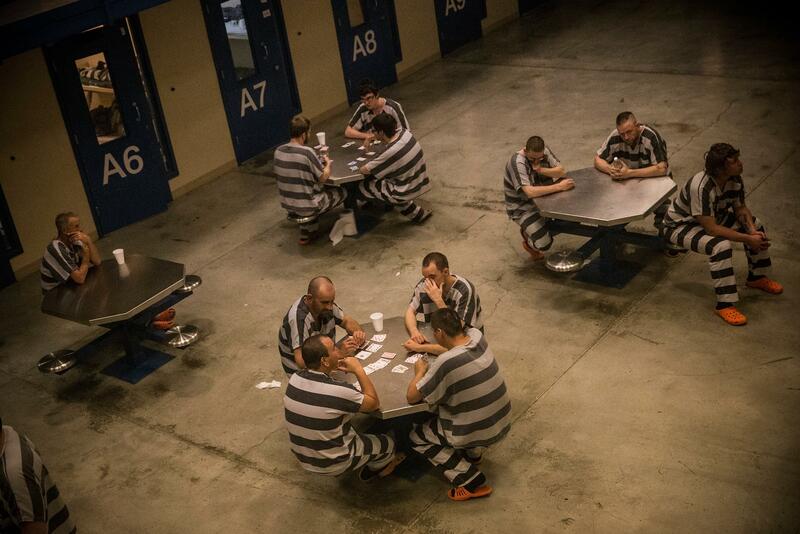 Inmates sit in the county jail in Williston, North Dakota. “This is nothing less than historic,” Holder said Tuesday, addressing a conference at the New York University School of Law. “To put these numbers in perspective, 10,000 inmates is the rough equivalent of the combined populations of six federal prisons, each filled to capacity.” The federal prison population stands at about 215,000 this year. “Looking at both state and federal statistics, the attorney general said that in a roughly five-year span, both the overall crime rate and overall incarceration rates fell by around 10 percent, something [Holder said] hadn’t happened in more than 40 years,” NPR reports. Mr. Holder attributed the drop in the number of federal prisoners to efforts to reduce long mandatory minimum sentences for nonviolent offenders. It also comes four years after the passage of the Fair Sentencing Act, which shrunk the disparity in sentences for crack and powder cocaine … Throughout his six years in office, he has made it a priority to reduce what he views as overlong prison sentences and an unnecessarily high incarceration rate … Mr. Holder and other advocates of shorter sentences for nonviolent offenders say that they relieve strains on budgets without leading to an increase in crime … Some Republicans have criticized the administration’s efforts to reduce sentences, saying stricter punishment was critical to the decline in crime rates over the last two decades. The decline of the federal prison population, however, has not corresponded to a reduction in prisoners at the state level, where the number of prisoners has increased. “Statistics released last week showed that the number of state prisoners rose by 6,300 to 1.4 million in 2013, the first increase since 2009,” according to the Journal.